Andrew Dawson and John Kirk in Daytona, FL for the launch of Sunwing's new route. Sunwing Vacations hosted just over 120 travel agents to celebrate their inaugural flight to Daytona Beach, Florida. The airline is Canada’s only to offer direct non-stop service to the long time favourite destination for generations of Canadians, with two flights per week. Andrew Dawson, Sunwing President and COO said “We are very excited to add our fourth new destination for the coming winter. Everyone connected with Daytona Beach from the Airport to the CVB, hotel partners and local businesses have been really supportive and loved having the opportunity to showcase this exciting destination." The flight was met with much fan fare by locals dignitaries and representatives of the Daytona Beach Airport. The Sunwing team worked tirelessly to ensure participating travel advisors made the best of their one day FAM. Reg Mendes, VP USA of the Sunwing Group, and considered the architect of the new program, was on hand and commented, “Florida is an integral part of our overall USA product line, adding Daytona Beach is the icing on the cake for us. Clients can enjoy two centre holidays, and fly/drive with Alamo, located "on airport" plus many other options. 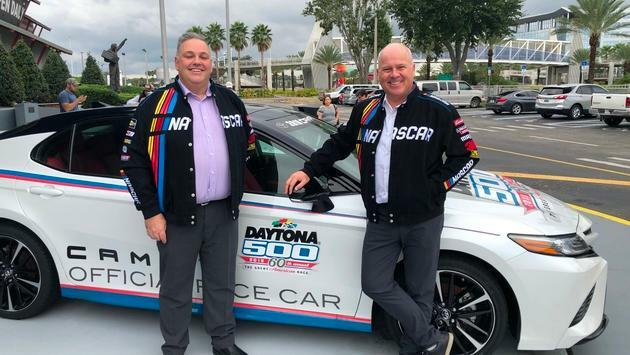 Agents were treated to a tour of the world famous Daytona International Speedway, home to the Daytona 500 - a huge treat for NASCAR fans. The group also had the opportunity to visit two of the featured hotels offered by Sunwing Vacations, The Hilton Daytona Beach, and the all new Hard Rock Hotel Daytona Beach. Both sit squarely on the world famous beach, making ideal retreats for Canadians looking to escape the cold. It's also perfect for families who are considering a beach vacation, with the thrills of Orlando and many attractions only an hour or so away. Flights and packages are currently available for agents to book.